Get lost in a swirl of dream pop and storytelling with Shoeb Ahmad. 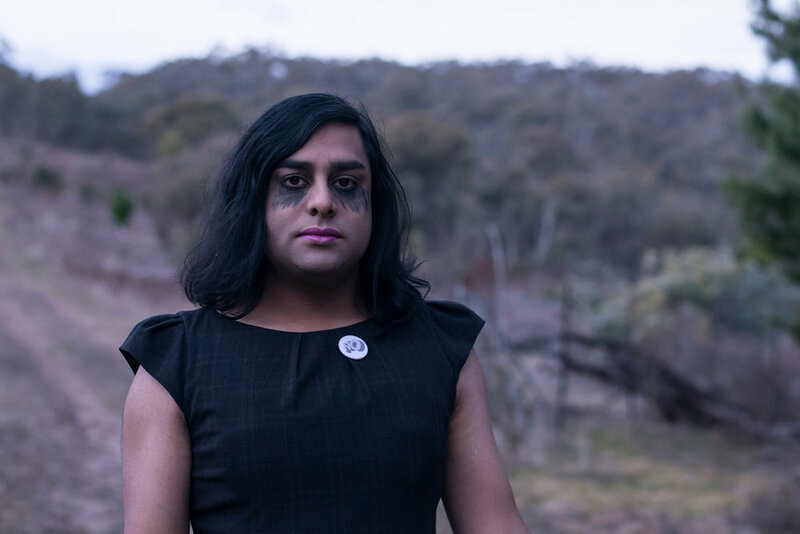 A staple of the Canberra underground music scene, Shoeb proudly identifies as a person of Bangladeshi heritage and a transgender woman. Her music is known for exploring deeply personal experiences and vulnerabilities, in an evocative mix of acoustic and electronic indie pop. Her latest project im/modesty will premiere as a live performance work with contemporary music ensemble, Australian Art Orchestra. Originally developed as a multi-speaker installation during a residency in Kerala, Southern India, this work is inspired by the cultural barriers people from the Indian sub-continent face when exploring their sexuality. This ground-breaking work features text spoken by three voices in different stages of life – interspersed with electronic music and atmospheric recordings from the streets of India. The talented multi-instrumentalist emerged back in the mid-2000s when she released a string of exceptional bedroom recordings. Since then she hasn’t stopped creating, releasing the intricate and moving new album 'quiver' earlier this year. Shoeb's music beautifully navigates the intersections of their identity, from coming out to being a parent. A concert series for the curious. This intimate performance series by the Australian Art Orchestra features cutting-edge artists from Australia and Asia. Experience a curated lineup of never-before-seen works, electrifying improvisations and cross-cultural collaborations. Exclusively for this series, hidden spaces throughout Arts Centre Melbourne will be transformed into intimate pop-up venues. Im/modesy will be performed in the historic Potter Foyer – which is credited for reviving the dying Melbourne Jazz scene in the mid-80s as the venue of Jazz After Dark. As one of the only jazz clubs in the city at the time, music luminaries from around the world came to perform at these wild nights. Meeting Points Series is a creative collaboration between Australian Art Orchestra and Arts Centre Melbourne. More info here. im/modesty is supported by the City of Melbourne and Australia Council for the Arts.